Carnival Cruise Lines has revamped and rebranded its guest recognition program which offers a variety of exciting benefits and perks to the line’s loyal past guests. Blue (pre-cruise and first-time cruisers): In a cruise industry first, guests who have never sailed with Carnival before can join the VIFP Club for access to members-only specials, promotions and other offers. Offers will change regularly and pre-cruisers and first-time cruisers are encouraged to visit www.carnival.com/VIFP often to get the best deal on their first Carnival vacation. Red (2nd sailing to 24 cruise days): Benefits include a complimentary alcoholic/specialty beverage at breakfast or lunch or at the Punchliner Comedy Brunch Presented by George Lopez, a new e-newsletter, and members-only cruise specials and other offers. Gold (25 to 74 cruise days): Members receive a keepsake Gold member pin, a Gold, Platinum and Diamond members-only shipboard cocktail party with complimentary drinks and appetizers, as well as all of the benefits of Red level VIFP Club membership. Platinum (75 to 199 cruise days): Benefits include priority embarkation, debarkation, tender service, and dining times (including main dining room and specialty restaurants, if applicable), an enhanced logo gift item, along with a ship- and year- specific pin each voyage that will be redesigned annually, a dedicated phone number and concierge desk on board, complimentary wash and fold laundry service, casino buy-one-get-one tournament entry, complimentary arcade $5 play for guests under 18, as well as all of the benefits of the Red and Gold level memberships. Diamond (200-plus cruise days): Members receive guaranteed dining times and specialty restaurant reservations, acknowledgement from the captain at Gold, Platinum, and Diamond Party, unlimited wash and fold service, complimentary dinner for two in the specialty restaurant of their choice, if applicable, complimentary luggage tag and passport holder, a one-time complimentary upgrade or a third or fourth guest sail free offer, a $100 per member contribution to St. Jude Children’s Research Hospital, as well as all benefits of Red, Gold and Platinum level membership. Milestone Cruise Rewards – VIFP Club members sailing on their 25th, 50th and 75th cruise will receive a shipboard credit equal to 25, 50 or 75 percent of their cruise fare, respectively, for that voyage. Members sailing on their 100th cruise earn a complimentary Caribbean, Mexican Riviera or Alaska voyage of up to eight days in length. 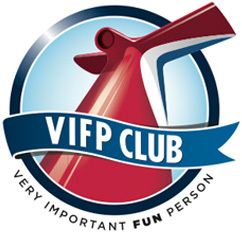 VIFP Club members also have access to a special web portal (www.carnival.com/VIFP) where they can review and modify their cruise history, chart their progress to the next VIFP Club level, watch a video overview of the program, and enjoy members-only specials, promotions and other offers. All Carnival past guests are automatically enrolled in the new VIFP Club and can use their existing past guest number to activate their profile by visiting www.carnival.com/activate. “We place tremendous value on our loyal past guests and it is extremely important to us that we have a guest recognition program that demonstrates our appreciation for their continued loyalty. Therefore, we’ve carefully designed the Very Important Fun Person Club to provide a more memorable experience for our loyal guests and to make certain we deliver the recognition they have earned,” said Rob Borden, Carnival’s vice president of customer marketing. The new program is being introduced on all Carnival ships departing on or after June 25 with the exception of the new Carnival Breeze whose VIFP Club program will be rolled out on July 9. For additional information on the VIFP Club or any of Carnival’s “Fun Ship” cruises, contact any travel agent, call 1-800-CARNIVAL or visit carnival.com/VIFP.